12 LISTS Once Upon a TimeLists about the original versions and real stories behind the fairy tales we've been whispering to sleepy children. The sound of children singing alone can be quite scary (see the Poltergeist main theme, or the "1-2 Freddy's coming for you" song from A Nightmare on Elm Street), but when coupled with certain weird and creepy nursery rhymes, the shudder factor rises exponentially. Let's take a closer look at some of these disturbing nursery rhymes, and perhaps you'll think twice before teaching them to your kids. If you think this little ditty is actually about gardening, you'd be dead wrong - as dead as the Protestant Queen Mary I, executed for her attempt to restore Catholicism as the national religion of England. The song is believed to be a clever jab at "Bloody Mary," with the "garden growing" bit alluding to the bodies she planted in the cemetery, the "silver bells and cockle shells" referring to torture devices, and the pretty maids all in a row symbolizing people lined up for the guillotine. Basically, there's a baby trapped in a tree, getting rocked in a cradle by a violent wind. The gusts are so strong, the tree branch from which the baby is hanging snaps in two, plummeting the baby to the ground. If the child isn't killed, it's at least going to need immediate medical attention. And this song is sung to children as a lullaby. Sweet dreams, kiddo! Naturally, The Simpsons parodied "Rock-A-Bye Baby"'s horrid implications in their very first short on The Tracy Ullman Show. Someone really needs to call child services on this crazy woman. And then he loved her very well." Okay, so it's established that Peter likes to eat pumpkins, right? So, his wife wants to leave him. Okay. What does he do? He puts her in a pumpkin shell, where he keeps her quite well. Does this mean he eats her? 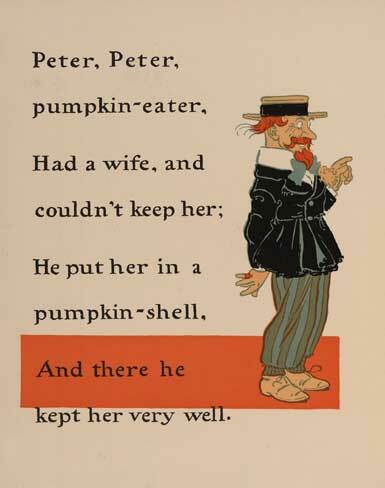 Even if the rhyme doesn't suggest cannibalism, it does state that Peter imprisons his wife when she attempts to get away from him (probably because he's spending all their money on pumpkins). That's pretty messed up.